U.S. auto sales dropped 37.1 percent in January, dragged down by the Detroit 3, as the industry posted its lowest monthly total in 27 years. Ford Motor Co.s 41.6 percent fall and General Motors 49 percent drop were steeper than analysts' forecasts. Chrysler tumbled more than 50 percent for the second straight month. Honda, Nissan and Toyota all slipped more than 27 percent, cementing the industry's fourth straight monthly slide of more than 30 percent. The annual selling rate of 9.8 million units matched a rate last seen in August 1982. 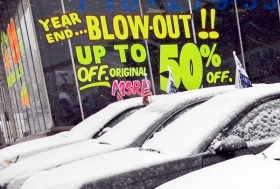 The sales total of 656,881 vehicles was the lowest since December 1981 and marked the 15th-straight monthly decline. The credit crunch is stifling sales, said John Broderick, general manager of Burlington Automotives Chevrolet store in Burlington, N.J.
Financing is very difficult. Its the toughest Ive ever seen, he said. Last autumn, GMAC Financial Services effectively stopped consumer lending, requiring credit applicants to have prime credit scores. The GM-exclusive lender loosened restrictions in December, but said today it financed just 5,000 purchases in January. Only one of those deals was from Brodericks store. GM today responded by initiating a round of incentives that includes 0 percent financing and higher rebates. The program covers some of GMs best-selling vehicles, including the Chevrolet Malibu. Only two companies gained: Hyundai-Kia and Subaru. Each saw sales rise about 8 percent. Subaru was the only automaker to record an increase in U.S. sales last year. Hyundai brand sales rose 12.5 percent after the debut of the Hyundai Assurance Program Jan. 2. The plan allows customers who lose their jobs within a year of their purchase to return their new vehicles at no cost if theyve made two payments. Buyers are very loyal to the Asian brands, but theyre also very price sensitive, and they might be considering Hyundai or Kia over Toyota or Honda, said Jesse Toprak, executive director of industry analysis for auto information site Edmunds.com. The industrys January results reinforce projections that any recovery wont happen before midyear. The also heighten the challenges for GM and Chrysler. The two companies are preparing viability plans for the U.S. Treasury Department in order to preserve the $13.4 billion in federal loans they have already received. Ford is trying to continue operations without federal aid, despite burning through $5.5 billion in cash last quarter. Last year's light-vehicle sales dropped to 13.2 million, as soaring fuel prices in the first part of the year and a global credit crunch later in the year deepened a national recession. The annual sales rate peaked at 15.6 million in January and skidded to 10.4 million in December. In 2007, 16.1 million light vehicles were sold in the United States. Jan. Jan. Jan. 1 mos. 1 mos. Pct. 2009 2008 chng. 2009 2008 chng. The biggest reasons for the decline in last months sales rate was the fleet market, said Ford sales analyst George Pipas. "We estimate the industry fleet sales were down 65 or more percent from a year ago." Ford said its sales to individual customers fell 27 percent. The two-thirds drop in fleet includes a 90 percent decline in sales to rental companies. Fords re-engineered F-150 pickup gained retail market share in January, the automaker said. But total F-series sales fell 38.6 percent in January. January fleet sales fell partly because of U.S. automakers' extended plant shutdowns after the year-end holidays, analysts say. In addition, some corporations took advantage of GM's December fleet incentives. The industry started 2009 with a 94-day supply of vehicles, more than 50 percent above the level recommended by analysts. Wary consumers crimped sales at Jim Arrigos Dodge-Chrysler-Jeep store in West Palm Beach, Fla. Arrigo sold 160 new vehicles in January, down from 325 last year. The Conference Board, a market information group, said last week its 42-year-old survey of consumer confidence slid to record lows in December and January. Bob Carter, head of Toyota Division, said he doesn't anticipate any rebound in the market until the second half of the year. "There were no surprises in January for the industry and the segments," he said. "The market turned out the way we anticipated." Jamie LaReau, Amy Wilson and Kathy Jackson contributed to this report.